“I am delighted to speak on this occasion of the Business and Climate Summit (BCS) 2017. I am glad that the Summit has brought together businesses, investors and policymakers to mobilise the business community in support of climate action. The world came together in 2015 and agreed upon the Paris Agreement under the UN Framework Convention on Climate Change. It came into force in November 2016 and till date, 160 Parties have ratified the agreement. India as a party to the Paris Agreement is committed towards its successful implementation. In order to strengthen Pre-2020 actions and close the emission gap, we also need to agree on a timeline for early ratification of the Second Commitment period of the Kyoto Protocol. India deposited its instrument of acceptance of the Doha Amendment to the Kyoto Protocol on August 8, 2017. UNFCCC should endeavour to promote developed country parties in fulfilling their commitments in the Pre-2020 period. One of the key features of Paris Agreement is ‘Nationally Determined Contributions’. India submitted its NDCs in 2015. It includes 8 goals, 3 of which are quantitative, including reducing the emissions intensity of our GDP by 33 to 35 per cent by 2030 from 2005 level; achieve about 40 per cent cumulative electric power installed capacity from non-fossil fuel based energy resources by 2030 and creating an additional sink of 2.5 to 3 billion tonnes of carbon-dioxide equivalent through additional forest and tree cover by 2030. The other five goals pertain to healthy and sustainable lifestyle, climate friendly and clean path to economic development, building capacities on climate technology and mobilise domestic and new additional funds. We are now working on developing a roadmap for implementation of our NDC and have constituted an Implementation committee and six thematic Sub-committees involving key Ministries and Departments. To achieve the goals, Government of India is implementing the National Action Plan on Climate Change (NAPCC) which encompasses eight national missions representing multipronged, long-term and integrated strategies for achieving key goals in the context of climate change. The broad policy initiatives of the government are supplemented by actions of the State Governments through their State Action Plan on Climate Change. Key sectors covered by SAPCCs include agriculture, water, habitat, forestry, health and disaster management among others. Government of India has set an ambitious target of 175 GW renewable power installed capacity by the end of 2022 and we have already achieved 58.3 GW of renewable energy installed capacity so far. There are a number of other initiatives including distribution of energy efficient appliances where we have distributed about 23.39 crores LED lights; Pradhan Mantri Ujjwala Yojana to provide free clean cooking gas connections to women below poverty line where more than 2.8 crore LPG connections have been released. Through our missions like AMRUT and Smart Cities Mission, we are transforming our cities to make them efficient and climate resilient. Government of India is also implementing its own National Adaptation Fund with a corpus of Rs. 350 crore. However, with the responsibility of lifting around 360 million people out of poverty and raising the standard of living of an even greater number of people, technology is one of the powerful solutions for countries like India that can simultaneously address climate change and our development needs. At the international level, under the leadership of the Prime Minister, India launched the International Solar Alliance (ISA) jointly with Government of France. It provides a common platform where global community including bilateral and multilateral organisations, corporates, industry and stakeholders can make a positive contribution to the common goals of increasing utilisation of solar energy in meeting energy needs of ISA member countries in a safe, convenient, affordable, equitable and sustainable manner. So far, 36 countries have signed the ISA and 7 countries have ratified it. 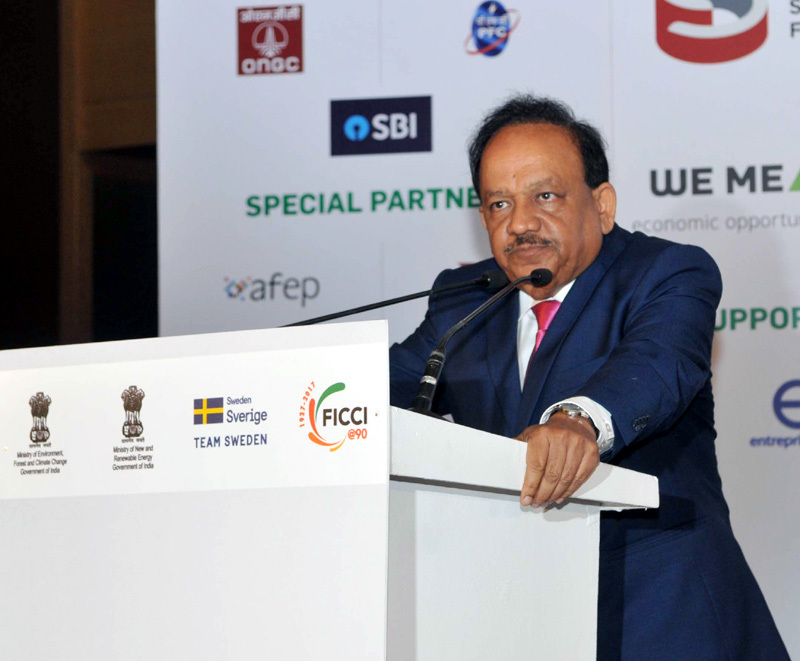 Private sector is an integral part of India’s action on climate change as well. Private sector has embarked on a number of voluntary actions. The Indian industry has participated in voluntary carbon disclosure programmes whereby they report their carbon management strategy and GHG emissions. India is also planning to establish a voluntary carbon market with World Bank assistance with focus on uncovered areas. Going forward, as political leaders and representatives of the people, we have major role and responsibilities towards the citizens of our country and the globe and a duty to think long-term. We should listen to the voice of science seriously and act accordingly to safeguard our people against the risks posed by climate change. Sustainability has been a way of life in India for centuries. Indian ethos and values promulgate simple living, respect for life and reverence of nature. Irresponsible pursuit of extravagant lifestyle is slowly eroding traditional values and as a result, minimalist lifestyle, has started to ebb from people’s way of life. Access to clean air, water and a liveable climate are inalienable human rights. And solving this crisis is just not a question of politics. It is our moral obligation. We have only one planet and humankind must become accountable on a massive scale for the wanton destruction of our collective home. Protecting our future on this planet depends on the conscious evolution of our species. The global nature of climate change calls for a collective response. India has been engaging actively in multilateral negotiations under the UNFCCC, in a positive, constructive and forward-looking manner to establish an effective cooperation and equitable global approach, based on the principles of Common But Differentiated Responsibilities & Respective Capabilities (CBDR-RC) enshrined in the Convention and the Paris Agreement.